Share with us your Co-Op experiences, challenges, and tips on how to overcome it. We'd love to hear from you so, comment below. Need more active Co op players.. Most of our players are having personal issues so they are not playing. my co-op gone quiet lately not sure if they are on when im not but i hate to let them go n get some new ones that want help out with events n other things. ours just not showing up not sure why. I know 1 she is maxed out on everything guess if they expand barn silo n land she be back on again. i know some delete them from our co-op but most of the time im delete them. Esp we had one player had like full farm all gold extras silos machines all land bought n it was strange that they were level 1 i forgot to send to zynga but i deleted it. besides never on or maybe comes on n buys out co-op things without saying a word. I'm starting to wonder what it is that people expect from a co-op. I have my own little group and I am struggling to keep it full and active. Most people join up,don't even say hi and start asking for stuff. If they don't get any they leave. The same people who ask for everything are the ones who dump everything on global as soon as they finish a phase in an event. That they might help out someone in the Co-op does not cross their mind . I myself always make a few extra items before finishing a phase and I pick up everything that might be useful for the Co-op on global. And half the people in the co-op don't even communicate. They play but never help out with anything. Why join? I've been playing for years. I've got max level and reached max capacity on my barn recently. I don't need help myself but still I'm dissapointed . The idea of a Co-op is nice but it does not seem to work because of the people. How about you guys help the leaders manage co-op? I haven’t received a request for so long, and I think it’s no longer working. People only join when co-op is open, and steal then leave. I call them co-op pirates. @Gracia I totally agree with you and am constantly fed up with such people. I absolutely hate to open the coop because all I see is such people flood in (and then have to boot them...) It seems that the ratio of getting a normal, decent, polite, and considerate member with common sense, gratefulness of what they get and manners is about 1 in a 100. Has been like that forever, but it seems that it's getting even worse. Manners and taking others into consideration seems to be completely out of fashion nowadays. I have the same problem with my co op I open they join and clean out market and steal what they can then leave or I end up booting them. Our problem is co op cap on MARIE'S ORDER board, zynga really needs to lift the cap if it weren't for that I would have a good co op but as it is I have to boot players for not getting points on board even if besides that they are good members. Right now we have 14 MEMBERS 7 of them have maxed out at 60 points but still we are 100 plus points from goal because the other 7 only have 7 to 20 orders done.so frustrating. I’m not a co-op leader, but I love my co-op! We chat, help each other and respect one another. We don’t steal from each other. I guess co-ops like this are rare and maybe I’ve hit the jackpot. You have @Katz_05. And there are others too. And I have to add, now that I reread my own message, that we have wonderful people in ours too, the problem are those who join, just to clarity lol. Getting one that can be kept is like hitting a jackpot too. Coop leaders have the right to set their own maries order amount. Just put it in your coop rules. I had mine set at 20 and everyone for the most part met their goal. The second week missing it they were deleted. It will not stop the ones coming in and doing 1 and leaving but your other members will honor the rule if they like the coop and want to stay. Most weeks they had met goal by Sunday. If you tell them upfront what is expected they will do it or voice their opinion right off. Either way you both understand. The door swings both ways no one is making them stay. Instead of complaining lead. You are their leader if you do not communicate what you need out of them don't get mad at them for what they do. As for stealing and leaving they can't steal what is not there. Clear your market and orders off before opening the door and tell your players not to put anything up or take anything until rules are communicated to new players. It is your coop lead it. You do not have to be rude or snarky set the rules and stick by them. These are your kids some follow the rules some see how far they can push you. Stand by your rules: you will have a better coop for it. Thank you! This was not directed toward anyone nor meant to offend anyone it is just my observation. All I see anymore are complaints. I have been guilty myself. Quit blaming Zynga for absolutely everything and use this blog for which it is intended to help people. Just a few opinions of mine regarding the last 3 posts. I don't have rules for how many orders people have to fill, but in my opinion 20 is not too much to ask. Everyone in the coop gets the rewards at the end of the week, so it's only fair they do their share too. Different coops also strive for different things, some for most efficiency when it comes to Maries board or achievements, some just want to make friends and chat etc. There are likeminded players for each style of coop. In mine I most of all endorse balancing one's asking and giving. I could as well endorse a rule of min orders filled for reasons stated above - it's only fair. Especially if those players don't help others in other ways either. Just hadn't found a real need to so far. We also clear our boards from valuable coop locked items just to save us form getting annoyed by those who coop shop for items. Ours are not for such, they are there to help members in our own coop. People aren't annoyed that we do that, what they are are annoyed about is if people jump in just to grab all that is worth anything. Those who jump in only to shop couldn't care less what we type in the chat when they enter. They're gone before we've finished our typing. We clear the boards to save us from getting aggravated and repost them back later. And to be honest, many adults do act like kids and do push their limits to see how far they can get by just mooching around, being incosiderate, impolite etc. Which btw is beyond me. I so often feel puzzled that I have to rant about common sense, manners and what it means to be considerate and cooperative to grown up people. I try a few times (first nice, then firmer, then not so nice), give some chances and if they instructions don't sink in, then those people will be removed. If people behave like spoilt rotten kids, then they have to be treated as such. Just my 2 cents worth do defend what @paulas wrote, since imo such harsh criticism was undeserved. If I understood correctly she first and foremost tried to point out, that each coop can endorse rules that they find make their coop work best and encouraged people to do so, and also to give a hint for those who's coop is filled with people who don't participate at all and only mooch around to get weekly rewards. I love my coop. We’re always pretty active. Lovely helpful people. Very understanding of the fact it’s just a fun game. - remove the 60 cap. We have a nice group at the moment. Would love to leave it at that but having to get a 1000 orders in forces us to open the doors every few weeks. Or even raising it to 100 would help. - give us a rules and announcement page. Everything we type is snowed under in a minute by chat. Does not work with rules or anything else you want everyone to read. - we need to know who is buying to prevent stealing. Half of the people in the group have pics that are not showing. Or only occasionally. If loading pics is an issue maybe it is possible to show names? Or....keep the slots for random items and make it so you can send the item someone needs as a gift instead of posting it. That way it can't be stolen. Just dreaming a bit here. Just like dreaming about the return of the bingo event. You know it’s real simple and it’s your coop, do as you see fit! Since I think you at least partly referred to at least my post @Jenkey, I do feel I have to defend what I said a bit. This: "by just mooching around, being incosiderate, impolite etc. Which btw is beyond me. I so often feel puzzled that I have to rant about common sense, manners and what it means to be considerate and cooperative to grown up people" and "behave like spoilt rotten kids" refers to exactly such people I say in there. I don't rant around just for the heck of it, and, yes, we sure have fun. But if people abuse other members in any way (which would be those who have recently joined), I will step in. If people steal, never help others yet ask for stuff constantly and even get angry if they don't get them, never ever say thank you, etc. (more in @Gracia's post) - whatever happens to happen that is the exact opposite of being considerate, cooperative and polite, I don't just sit there and watch. First time will be as kindly as I can put it and when I said firmer, that would be when the hint is not either taken or understood. Third is when I tell them why they will be removed from the coop if either works. I'm glad if your coop has never had such members join, but ours has, and I do defend my members from feeling abused or neglected, taken advantage of, or getting sad or upset. @M1P4 my apologies you felt I was meaning partially of what you said, but my post had nothing to do with what you posted. @Jenkey No need to apologise. Not even if it had We all have the right to our opinions. Just that after seeing yours, I felt the need to clarify what I meant. So many seem to complain about "dictatorship" and whatnot when they complain about leaders and I always wonder what they mean by that. So no answer to that yet then. So far I think most them are the ones, who do exactly what I said I don't tolerate in mine and some others said they don't like either. Who knows. If anyone has any views on what people mean with such complaints, I'd be happy to hear. Our coop rule is pre-buying ask, post buying chat thanks. The purpose of the rule is to assure chat reading. We were having players request items then others buying those items. We requested to post the bought items and no response. As we cannot contact coop members other than chat, posting thanks assures opening chat seeing your name then posting items. I cant stand coops. They make you have a picture and a lot of players in other countries don't have them. Children like to play the game but they are not allowed in most coops and are told to connect to facebook which they are not supposed to be doing. Most of the coops I have been in, which is a whole bunch, are led by wardens. People that have absolutely no other existence and want you to do the same. It's a joke. I have no interest in taking this game to that level of dedication. It's purely how I wind down and let my mind go in the evening. Coops are racists, they delete people because of their names, spelling, language, etc. All of them do it, Americans, Indians, etc. It's disturbing to see how people really treat each other. 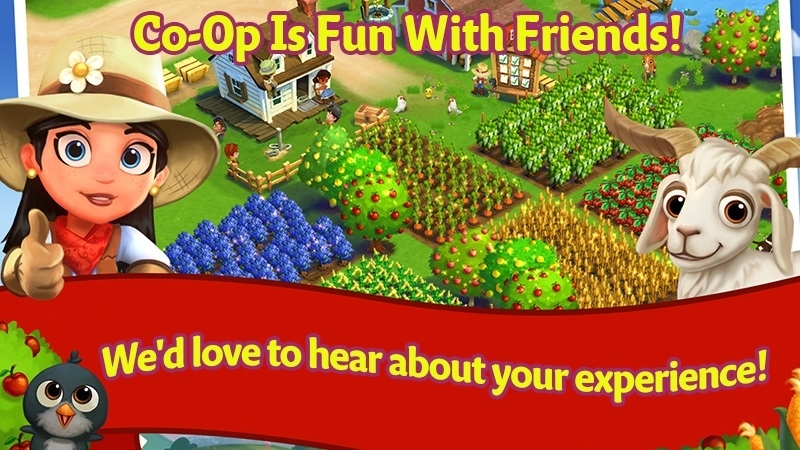 @calfarms oh wow, but I will have to disagree with “all coops” are bad because my coop is not like that at all, I’m definitely not a warden and no one on my team is demanding. My coop is polite, helpful, friendly and give common courtesy of checking chat before taking a coop item, we chat with one another and have become friends! And yes we have relaxing evenings on our farms with absolutely no drama! So it you want to experience what a coop should really be like, look us up and join us! > I'm starting to wonder what it is that people expect from a co-op. I have my own little group and I am struggling to keep it full and active. Most people join up,don't even say hi and start asking for stuff. If they don't get any they leave. The same people who ask for everything are the ones who dump everything on global as soon as they finish a phase in an event. That they might help out someone in the Co-op does not cross their mind . I myself always make a few extra items before finishing a phase and I pick up everything that might be useful for the Co-op on global. And half the people in the co-op don't even communicate. They play but never help out with anything. Why join? I've been playing for years. I've got max level and reached max capacity on my barn recently. I don't need help myself but still I'm dissapointed . The idea of a Co-op is nice but it does not seem to work because of the people.
? Well when it comes to my co-op no one chats eighther and I only get speed seed from 3 of them. No one else does. They help me with everything else, just no speed seed. I try to inform all new players in my coop of our groups rules as they enter, also when I open coop so new players can come in I say hello or hi to each one I see new in coop list by name , the ones who reply back and join in and follow our coops rules stay....the ones who never speak, or help, but yet are sitting and swiping things others in coop asked for they don't stay very long .....this works well as I'm never short of good players in my coop.